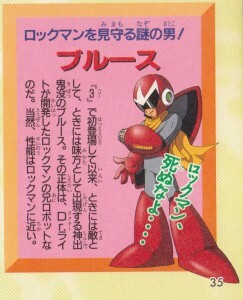 The mystery man who watches over Rockman! Blues made his first appearance in “3”, where he’d pop up unexpectedly sometimes acting as an enemy and at other times as an ally. His true nature is Rockman’s older brother robot developed by Dr. Right. Naturally, his abilities are quite similar to Rockman’s. So brother, you are not as weak as I thought. Let’s see which of us father made stronger! So, you finally made it this far? Rockman! Why don’t you show me your power!! Maybe you are the superior model, Megaman. Here, take this with you. You’re even stronger than I expected. This may come in handy in the battles to come. Here, take this. You can’t give this to me! Th-this is… your Blues Shield! But isn’t this shield very important to you? And… watch your back… It’s ok. Take it. Like we mentioned earlier this week, Rockman is unaware that Blues is his older brother. The English version of the script added references to the two being brothers, while dropping being careful around “that guy,” probably referring to Forte. Which version do you prefer? Why not share it in the comments below! 3 Comments to "Brother Against Brother?" I’d say English (mostly because I don’t have to rely on a translator for it :p ). Interesting that, in the US continuity (as it were), Mega is aware of his relation to Proto; in the JP continuity, he isn’t. I actually didn’t know that there was a difference until Gauntlet mentioned it a while ago. Hmm, this certainly gives one some ideas as to how things could play out… perhaps Proto Man isn’t as secretive about his relation to Rock as Dr. Light is…? Blues seems to like his secrets. Proto Man didn’t want to discuss his connection to Mega Man when Duo asked about it in their combined ending for The Power Fighters, but maybe he just doesn’t like to get too personal or mushy. I’m not too sure why they want to keep it a secret in the Japanese version, though. Maybe it’s a hard topic for Right to discuss, if he feels like he failed Blues. Maybe he respects Blues enough that he feels that if anyone should tell Rock, it should be Blues himself. Or maybe the press have a field day if they knew Dr. 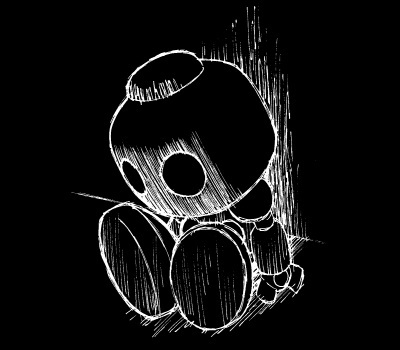 Right built such an uncontrollable robot? It’s hard to say for whose sake this secret is kept, even from Rock. Mega Man knowing that Proto Man is his brother and Proto Man openly acknowledging it probably makes more sense to me at this point.